Thanks for helping us find the perfect house. 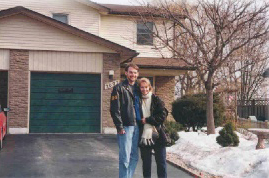 As first time home buyers we were overwhelmed with all there is to learn about buying a home. You gave us a good start on our research by providing us with the book How to Buy Your First Home. You answered all of our questions patiently and honestly and really helped us become informed buyers. Armed with our “wish list” you searched the MLS listings tirelessly, focusing on the houses that met our various needs. You showed us several houses until we came across what has now become our home. It met every requirement on our list except one-age. This ended up not even being an issue as the house was lovingly maintained. Thank you for all your help in getting settled in and familiar with the neighbourhood. Thanks a bunch from your feathered friends too!